The Finnish air corps of the Winter War were few in number in relation to their duties. In the first stage of the war, the Soviet forces outnumbered the Finnish forces at least six to one, and this ratio increased to perhaps even twenty to one over the course of the war. At the start of the war, Northern Finland and the frontline troops had practically no anti-aircraft protection. The importance of fighter aircraft was highlighted during the war. They were needed for counter-air missions in the home front as well as the rear of the frontline troops. In practice, the Finnish Air Force did not have enough resources to support the Army. The use of bomber aircraft focused on reconnaissance missions deep into the enemy’s rear. The main mission of the Finnish Air Force was to repel attacks by enemy aircraft, perform reconnaissance and support the ground forces. Aerial attacks were primarily repelled at the rear of the front line and by fighting against enemy aircraft targeting the home front. The reconnaissance missions that served the supreme command were carried out with long-range aircraft, i.e. Bristol Blenheim bombers. They were well-suited for bombing target areas in the enemy’s rear. The ground forces were supported with reconnaissance and aerial attacks. Fighter aircraft were intended for repelling aerial attacks by the enemy. In practice, the Finnish Air Force’s equipment was not sufficient for providing direct support for ground forces with aerial attacks. It became apparent during the war that the liaison aircraft could not carry out the reconnaissance operations required by the ground forces. The reconnaissance missions had to be performed with fighter aircraft. Bombers were unsuitable for providing direct support to ground forces because of the imprecision of bombings. the aircraft of the liaison squadron that specialised in dive bombing were already outdated. This was one of the reasons for avoiding the use of the squadron during battles. 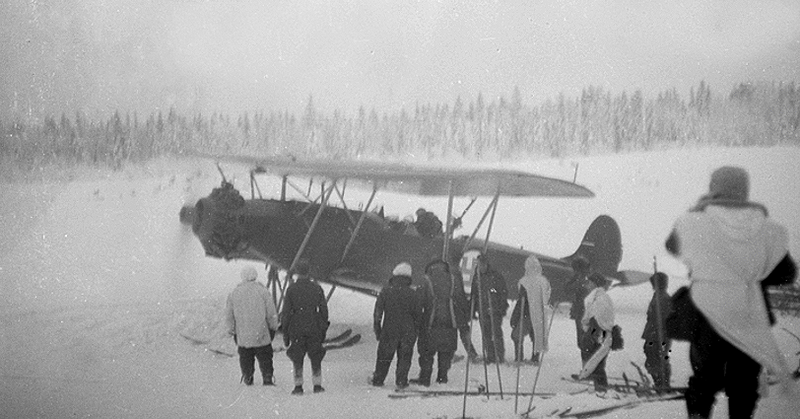 Reconnaissance aircraft Fokker CV on a visit to the IV Corps Headquarters in Suistamo (Suystamo) on 12 January 1940. SA-kuva. At the start of the war, the Finnish Air Force had a little under 120 military aircraft at its disposal. Only approximately 80 of them were suitable for deployment at the front line. This number comprised 36 fighters, 29 reconnaissance and liaison aircraft and 14 bombers. The air force had 14 modern Bristol Blenheim bombers, i.e. long-range aircraft. They were suitable for bombing target areas as well as for conducting reconnaissance flights deep into the enemy’s rear. There were a total of 46 fighters, and 36 of them were Fokker D 21 fighters. They, as well as the bombers, had been ordered in 1936. They were relatively modern, but the development of fighters had been rapid in the last years prior to the war. The air force had 10 completely outdated Bristol Bulldog fighters. Many considered them to belong in a museum. The air force had 56 reconnaissance and liaison aircraft, of which 29 were Fokker C X aircraft that were more modern but too slow. The rest of the reconnaissance and liaison aircraft comprised 15 Rippon II F aircraft and 9 Junkers aircraft that were too outdated for use at the front line. Finland lost almost 100 aircraft during the war. More than 60 of them were destroyed and well over 30 were damaged. These equipment losses were compensated by aircraft procured from abroad or received as donations. In principle, a little less than 140 of the aircraft procured or received by Finland as donations arrived in time to participate in the wartime flight operations during the latter half of the war in 1940. The first of the procured aircraft to arrive in Finland were the 30 Gladiator aircraft procured from the United Kingdom. The 30 Morane Saulnier 406 fighters donated by France arrived in February. The 33 Fiat G 50 fighters procured from Italy arrived in Finland at the end of February after some difficulties. They were suitable for reconnaissance and liaison aircraft. Finland managed to procure a total of 22 Blenheim bombers from the United Kingdom in two batches. However, two of the aircraft were destroyed when they were being flown to Finland. The first batch was deployed in January and the second at the end of February. The Finnish Air Force’s aviation units’ losses were 100 people, of whom 75 were killed or declared missing and 25 were wounded. Nine of the people killed and two of the wounded were foreign volunteers. The Soviet Union retained its air supremacy throughout the war. In good flying weather, it was difficult for the Finns to fly their aircraft during the day. The forces of the Leningrad Military District had 800 aircraft at their disposal when the attack on Finland was launched. Roughly speaking, a little under 500 of the aircraft were fighters, more than 200 were bombers and a little under 100 were reconnaissance and other aircraft. During the war, the number of aircraft apparently almost quadrupled, increasing to approximately 3,200. The Soviet Union’s aircraft were primarily from the 1930s. Its fighters included Polikarpov I-15bis, Polikarpov I-153 and Polikarpov I-16 aircraft. The bombers at its disposal included Tupolev SB-2, Ilyushin DB-3 and Ilyushin TB-3 aircraft. Its reconnaissance aircraft included Polikarpov R-5 and Beriev MBR-2 aircraft. The Finnish Air Force recorded that approximately 200 Soviet aircraft were shot down. Added to the number of enemy aircraft shot down by the ground-based air defence forces, the ground forces and the navy’s air defence force according to their own reports, the total number of downed aircraft is over 400. According to information published by the Soviet Union in 1986, the Soviet Air Force lost 261 aircraft and 321 pilots during the Winter War. Three flying regiments (FlR 1, FlR 2 and FlR 4) were formed during mobilisation. A total of 25 field logistics platoons were established for guarding and maintaining the wartime airports. Four aviation field depots were established for maintaining the aircraft behind the front lines. Three supplementary flying regiments (S-FlR 1, S-FlR 2 and S-FlR 4) were established for training the personnel. Almost 100 pilots and seven air observers graduated from these supplementary flying regiments during the war. Supplementary Flying Regiment 2 handled flight checks and training flights for foreign volunteers. Just under 20 foreign volunteer pilots were deployed in squadrons at the front lines. The liaison squadrons belonged to Flying Regiment 1, the fighter squadrons to Flying Regiment 2 and the long-range squadrons to Flying Regiment 4. Flying Regiment 1 was subordinated to the ground forces’ army corps in squadrons. The commander of air defence retained command of the ‘fighter regiment’, i.e. Flying Regiment 2, and the ‘bomber regiment’, i.e. Flying Regiment 4. The air force’s operations were focused on the Karelian Isthmus. The conditions for operations in the area north of Lake Ladoga were created in Ladoga Karelia and Border Karelia. Spanning from the latitude of Suojärvi (Suoyarvi) to the Arctic Ocean, Northern Finland was an area where the Finnish Air Force was not prepared to operate. With wartime changes in formations, the air force extended the operations of its aircraft to reach the latitude of Suomussalmi. 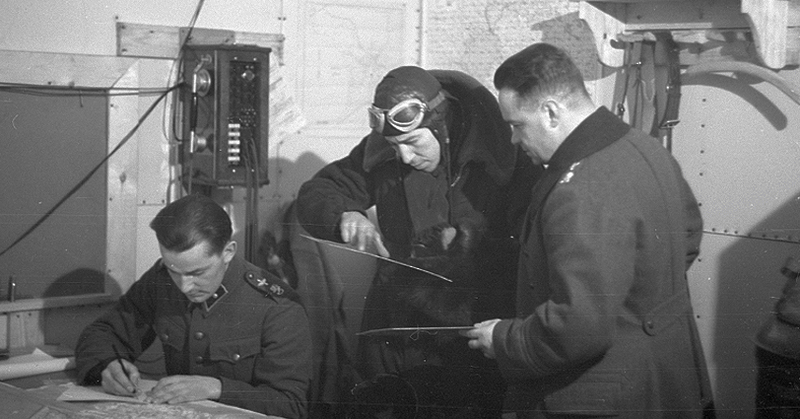 A pilot reporting the results of a reconnaissance flight at the IV Corps Headquarters in Suistamo on 12 January 1940. SA-kuva. At the start of the Winter War, the General Headquarters assumed command of one squadron (Sqn 10) from the Flight Group (Flying Regiment 1). This squadron specialised in dive bombing and was deployed in Lappeenranta. One of the Flight Group’s squadrons (Sqn 16) was relocated to the Mensuvaara airfield and subordinated to the IV Corps. One flight from the squadron was relocated to Lahdenpohja and subordinated to the Ladoga Naval Defence. The main units of the Flight Group were subordinated to the Army of the Isthmus (AIsth). Of the two squadrons left under the regiment’s command, one (Sqn 12) was deployed to the Suur-Merijoki (Seleznyovo) airfield. The squadron was intended to operate in the area of the II Corps, which was responsible for defending the western Karelian Isthmus, with another squadron (Sqn 14) assigned to the area of the III Corps, which was in charge of defending the eastern Karelian Isthmus. 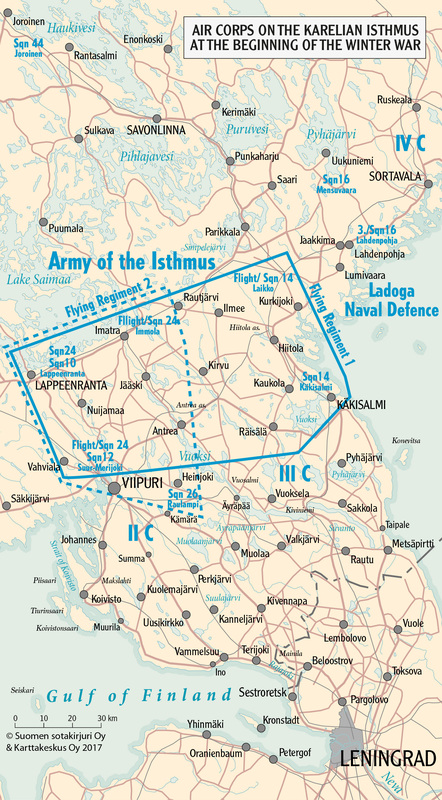 The squadron initially operated from both Laikko and Käkisalmi (Priozersk) airfields. One of the fighter regiment’s (FlR 2) two squadrons (Sqn 24) was divided between three airfields: Suur-Merijoki, Lappeenranta and Immola. The other squadron (Sqn 26) operated from the Raulampi airfield south of Heinjoki (Veshchevo) at the start of the war. The bomber regiment (FlR 4) operated from Luonetjärvi, from where one of its two squadrons (Sqn 44) was relocated to Joroinen immediately after the start of the war. The F-19 Flying Regiment, formed of Swedish volunteers, arrived in Lapland in January and began its operations on 12 January. The regiment was equipped with twelve fighters, four light bombers, two transport aircraft and one liaison aircraft. Both the Gladiator fighters and the Hart bombers were already outdated. The regiment operated primarily at the Salla front. During the war, the regiment lost three Hart bombers and two Gladiator fighters in aerial battles. Two Swedish pilots became prisoners of war. They were returned, with some stalling, after the end of the war. The operations of the air corps’ fighters focused on defensive counter-air operations on the home front and in the immediate vicinity of the front lines. The main mission of the fighters was to repel attacks by enemy bombers. The Finnish air corps usually tried to attack the Soviet bomber aircraft, which were protected by numerous fighter aircraft, with patrols of 2 to 3 aircraft. With the exception of the final stage of the war, the troops at the front lines were forced to fight without the protection of fighter aircraft. The air corps’ bomber aircraft were used for both bombing and reconnaissance operations deep within the enemy’s rear. The enemy’s air superiority became increasingly clear in February 1940. The Finns had to schedule their bombing and reconnaissance flights for the dark hours of the morning and evening. Bombing runs were also carried out at night. In March, when the Soviets launched their offensive across the frozen Vyborg Bay, the air corps participated in repelling them. Fighter aircraft were also increasingly used for supporting battles on land.